Ian O Bayne (Letters, 6 July) writes in support of Charlotte Fox with regard to the named persons scheme, saying Ms Fox’s contribution was “an excellent critique”. It was not. Ms Fox’s contribution was a flawed interpretation of how the scheme is intended to operate and Mr Bayne’s own comments illustrate powerfully how much the Scottish Government need to do to explain what the principles are which underpin the scheme and what it is it is intended to achieve. The Scottish Government has said that the named persons will be there as a point of contact for help and support should parents decide they wish to avail themselves of that assistance. They have said that the named persons will not have power to intercede in family life if the family do not wish it. However, following an intemperate rant on the subject from Stan Hogarth (Letters, 4 July), in which he made references to “a Soviet-style regime” operating in a police state, Ian O Bayne has joined the debate with references about “excessive state control” and a government showing “a lack of trust in the ability of most Scottish parents to bring up their own children without the supervision of the state”. He goes on to say that the scheme seems to indicate that the administration believes we are incapable of carrying out our child-rearing responsibilities, thus demonstrating powerfully that he simply does not understand how the scheme is planned to operate. I am of the view that it is probably wiser to avoid making excessive pronouncements when not in possession of the facts, but the Scottish Government needs to accept that when it comes to a subject as emotive as child-rearing, the lack of communication has created a climate where fear has bred misconceptions and distortions. For once, I am (mostly) in agreement with an SNP supporter. Ian O Bayne, like everyone I know, is clearly dead set against the absurd “named person” legislation enacted by the current, SNP administration. As he says, it shows that the SNP do not trust the Scottish people to look after our own children, proving that what they do and what they say are very different things. Far from wanting “freedom”, as they loudly declare, the SNP are, in fact, very repressive. Their attempt to enact prosecutions without corroboration proves that, as does their desire for a single, central database on every citizen in Scotland. When Mr Salmond complains about the BBC, it is because they will not bend to his will, as he would like. 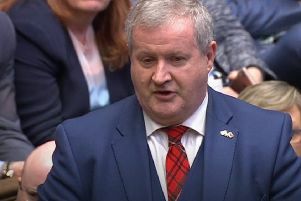 Equally, his attempts to make out that he had legal advice on Scotland remaining in the EU after a Yes vote showed that he did not trust the Scottish people with the truth. The SNP are very good at propaganda, making out that unionists think Scots are “too stupid” to be independent. In fact, we did not think it was sensible, for many different reasons. That, however, was not one of them. Their own followers, however, believe the untruths they make up about their opponents’ opinions. I hope that, as Mr Bayne has seen through this proof of the SNP’s controlling instinct, he will subject their other assertions to equal scrutiny.